Embaixador (Ambassador) is a Maracatu do Baque Virado, a complex variation of the Maracatu rhythm, dedicated to Antonio Madureira. Traditionally, "Maracatus" are carnival groups from Pernambuco called Nacones (Nations): Nacao da Cabinda Velha prevails in Old Recife while the Nacao do Leao Coroado is foremost today. Among the Maracatu dancers we have o Rei (the King), a Rainha (the Queen), Principes (Princes), Damas de Honra (Ladies of Honor) and o Embaixador (the Ambassador) who is the standard bearer of the parade. 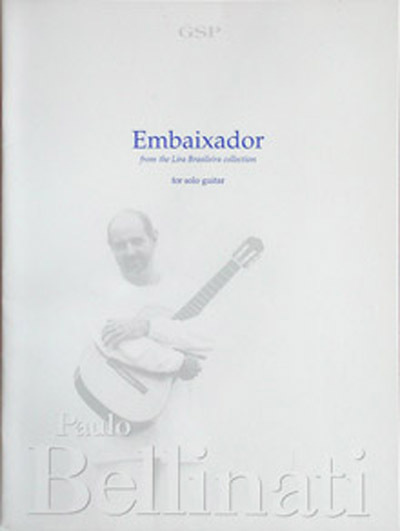 Embaixador is written in B Major and the guitar is tuned with the sixth string in B and fifth in F#, which extends the range, creating a bigger sound.